"What is truth?" asked Pontius Pilate as Truth incarnate stood before him.1 Whether the Roman governor was interested in the answer is doubtful, but we must ask ourselves who was really put "on trial" that day. Jesus? Yes, of course. But so was Pilate. In fact, each of us is put "on trial" every day, able to present our own answer to that same question: "What is truth?" Yet before we give a final account to the Judge of all judges, we will undoubtedly testify with our words and our works to those we encounter each day. Think of life as a courtroom. Is our testimony true or false, clear or unclear, consistent or inconsistent, reliable or unreliable? 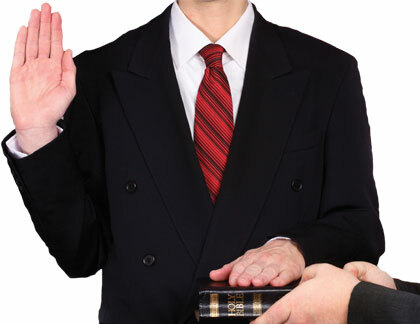 Are we true witnesses or false witnesses? In every forensic context, whether a civil lawsuit or a criminal prosecution, truth-telling is a serious matter.2 Forensic consequences rely on trial testimony, so testimony needs to be clear, reliable, and truthful. Judges recognize that conflicts in trial testimony cannot always be explained away as mistaken perceptions, faulty memories, or other inadvertent errors. Sometimes witnesses who know the truth testify otherwise because their personal agendas are not morally anchored in truth-telling.3 It has been that way since Adam. The ninth of the Ten Commandments says, "Thou shalt not bear false witness against thy neighbour" (Exodus 20:16). What was the penalty for breaking this commandment? Death, in some circumstances. Thus, a false witness who tried to "frame" an innocent man on a capital charge could be sentenced to death. The severity of this "punishment-to-fit-the-crime" was not an isolated example of Mosaic justice. For example, the ancient Babylonian law-code of Hammurabi (whom some equate with the Bible's Amraphel4), decreed that "if a man has borne false witness in a trial, or has not established the allegation that he has made, if that case be a capital trial, that man shall be put to death" (Hammurabi's Code of Laws, Section 3). Also, under ancient Roman law, the Twelve Tablets of Rome provided: "Whoever is convicted of speaking false witness shall be flung from the Tarpeian Rock." False testimony is not to be taken lightly! Do these principles of false testimony apply to the creation-evolution controversy? Quite a bit, actually. In short, false testimony within the church since Darwin's generation has accommodated his materialist challenge to God's role as Creator. The Apostle Paul wrote that God has provided everyone with proof of creation and His creatorship, proof so strong that suppressing it is adjudged inexcusable (Romans 1:19-20, 25, 28). Sadly, among Christian seminaries, colleges, and even churches, the teaching of Darwinian evolution in any form has historically been welcomed in many ways that dishonor Christ. How so? Recall how Aaron sacrificed truth and dishonored the Lord when he led the rebellious Israelites to worship a golden calf6 that supposedly "evolved" while Moses was absent.7 Notice that Aaron labeled the "spontaneously-generated" golden calf "the LORD" and not "Baal" in order to excuse the idol's inclusion into Israel's religious practices. Yet a golden calf statue, whether called "Baal" or "the LORD," is still a golden calf statue. A gold-ring-snouted pig is still a pig. Likewise, any theistic evolutionary explanation for origins--regardless of its label as "progressive creation" or "day-age creation"--is just a nicer name for compromise. Aaron's sin is called syncretism, a blending of pagan religion with biblical religion, which is exactly what theistic evolution is. It is false testimony about God the Creator. A related type of false witness is the Pharisee-like churchman who adds unbiblical traditions to God's Word (such as the "gap theory") so that the true force of the Bible is nullified (Mark 7:3-13). Unlike the heterodox Samaritans, the Pharisees appeared to be doctrinally "orthodox" in their view of the canon and authority of Scripture. However, as Christ explained, the actual practice of the Pharisees nullified the Bible's text and authority, obscuring biblical truths by illegitimate adherence to their own invented concepts, thus treating Jewish tradition as superior to the Word of God. Another type of false witness is the Sadducee-like churchman who detracts from the authority and text of Scripture by denying the Bible's authority and applicability (Mark 12:18-27; Luke 20:20-40). Jesus condemned this error as both ignorance and bad theology (Matthew 22:29). This error can be sophistically accomplished by evasive teachings (e.g., the slippery "emerging church" and the neo-deistic Intelligent Design Movement) that avoid recognizing the authoritative truth, perspicuity, and applicability of relevant Scriptures. Life will certainly put us "on trial" at times, allowing us an opportunity to testify of the Creator's majesty and authority. How should we then testify? Attempting to accommodate Darwinism by suppressing known evidence (whether special revelation in the Holy Bible, or general revelation in nature's design) leads one to perpetuate false testimony. A very dangerous idea indeed! To clearly and consistently tell the truth--the whole truth--is our obligation, as faithful witnesses of our Creator Redeemer. Compare Pilate's question in John 18:38 with Jesus' own teaching in John 14:6. See also Revelation 1:5. E.g., Federal Rules of Evidence, Rules 102, 401, 404(3), 405, 603, 604, 607, 608, 609, 611(c), 613, 615, etc. E.g., Fort Worth I.S.D. v. Wesley, TEA Dkt. #021-LH-1098 (2-28-1999 decision, within the Texas Education Agency website at www.tea.state.tx.us). See Merrill F. Unger, The New Unger's Bible Dictionary (Chicago: Moody Press, 1988), page 56, entry for "Amraphel." This historical development is chronicled in detail by several authors, e.g., Henry M. Morris, The Long War Against God (citing Teilhard de Chardin's Christianity and Evolution, etc. ); Henry Morris III, After Eden (citing Origen's allegorical hermeneutics, etc. ); Terry Mortenson, The Great Turning Point (citing clerics opposing the 19th century scriptural geologists; etc.). Ecclesiastical censorship politics, of course, are nothing new. E.g., see Bill Cooper's After the Flood (Chichester, UK: New Wine Press, 1995), 47. E.g., James J. S. Johnson, 2008, "How Young Is the Earth? Applying Simple Math to Data Provided in Genesis," Acts & Facts, 37 (10): 4-5, which eliminates the "open"-vs.-"closed" genealogy excuse for believing in an old earth. E.g., Henry M. Morris, 1988, "The Compromise Road," Acts & Facts, 17 (3). Cite this article: Johnson, J. J. S. 2009. To Tell the Truth: The danger of accommodating Darwinism through false testimony. Acts & Facts. 38 (2): 24.